Photography - Trial and Error way: How to take wide angle photos with a cell phone: Hollywood Sign- from a good to a great photo in 5 seconds. How to take wide angle photos with a cell phone: Hollywood Sign- from a good to a great photo in 5 seconds. 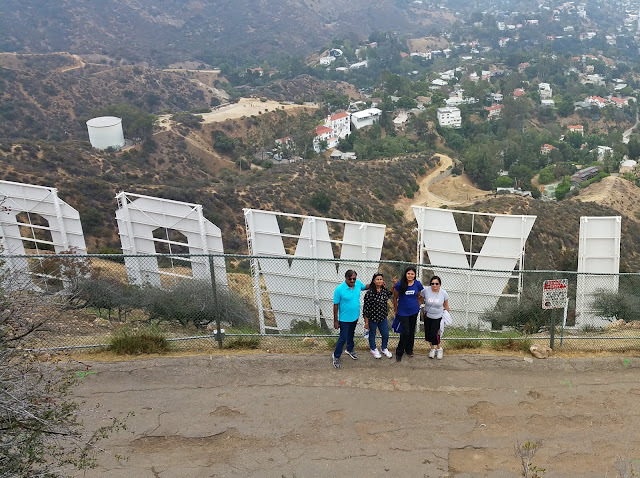 This weekend, I took a friend to hike on the Mt Lee which has world famous Hollywood sign on. This is a very nice, popular hike in LA. It is sad that the residents of the area, near Beachwood Rd, have made parking a nightmare. Most of the spots require permit so you really need to know me well to get some inside tips on where to park when you are thinking on hike on the Hollywood Sign hike- Mt Lee. Anyway, this is a photography blog so I don't want to bore you with hiking details. When reached the top of Mt Lee, we were above (behind) the famous Hollywood sign. We want to take a photo but when I took a photo with my camera, unfortunately my camera did not have wide angle necessary to get the whole sign in the background. Immediately, I had an idea. I took a regular photo with my Samsung Note 4 camera. Still the cell phone camera was not wide angle enough. So I changed the setting to Panaroma and moved my camera left to right. Within 5 more seconds, I had the whole sign in the background. It is all trial and error photography. Once I found what problem I had, I tried to find a solution and I had a nice photo. Trial and error photography- one easy way to take great photos.